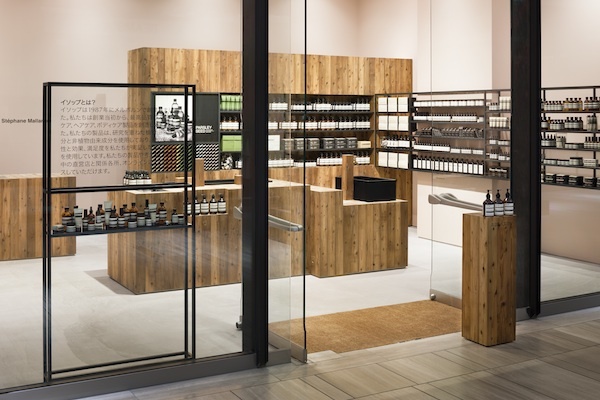 Japanese design and architecture firm Torafu Architects has collaborated with Australian skincare brand Aesop to design the interior of its Osaka shop, with cedarwood blocks used to create multiple display areas. Located in the Grand Front Osaka Mall, the space was a seven square metre box with 3.9 metre high ceilings and a glass facade that faces the promenade, spanning the entire frontage. “We wanted to create a natural feeling against the cold glass and stone materials decking the promenade. Looking for local materials, we found the once-baked Japanese cedar wood pillars,” said Torafu Architects. 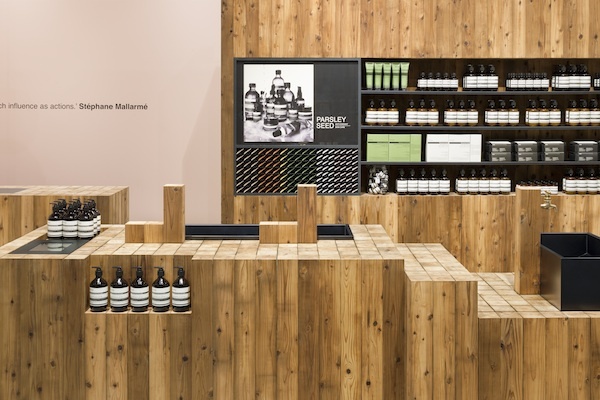 The Aesop shop fittings are made from squared cedar wood logs, positioned vertically and varying in height to house shelving and sinks, and to create counters, plinths and enclaves for product display. They also partition the storage room from the front of the shop. Blackened steel shelves at a continuous height around the perimeter of the shop provide continuity between the pink walls and the wooden fixtures, their lightness and transparency contrasting with the solidity of the wood. The blackened steel provides a visual connection with the window frames and is a material that Torafu Architects also used in the Aesop Shibuya interior, one of four other shops the firm has previously designed for the brand. Finally, the vintage pendant lamp over the sales counter and the lounge chair in the corner of the shop are intended to welcome customers into the space.